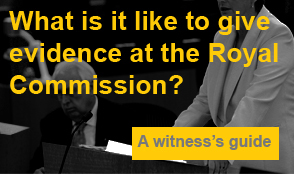 For decades it has been standard procedure for the Commissioner of Victims Rights to require the return of victims compensation awards paid under the NSW Government’s victims of crime compensation scheme if the applicant also receives money from another source in relation to the same act of violence; such as an award of compensation from an institution or a civil settlement against the offender. During the Bethcar Children’s Home Royal Commission hearing in October 2014, it came out in evidence that a group of survivors who had accepted compensation from the institution had received correspondence from the Commissioner of Victims Rights waiving the requirement for them to forfeit their victims compensation awards. It was not clear why the Commissioner had made an exception in this particular case. As a result, Peter Kelso began researching the matter and questioning the basis upon which the NSW Government had been taking back people’s victims compensation after they had received payments from institutions. Peter challenged the Commissioner on behalf of several of his clients, demanding the return of their victims compensation awards. In a few short weeks, each of Peter’s clients had their victims compensation, of up to $60,000 each, deposited back into their bank accounts. Kelso Lawyers want to help everyone who has forfeited their victims compensation to the Government. Click here for more information and to watch a video by Peter Kelso explaining how he can assist you.